After a few days of airing the kimono out, I decided it was time to dress the little fellow properly at last. Once the hakama was on, he looked quite the little samurai. You may have noticed in the first photos that his hakama was tied on backwards and up to his neck. 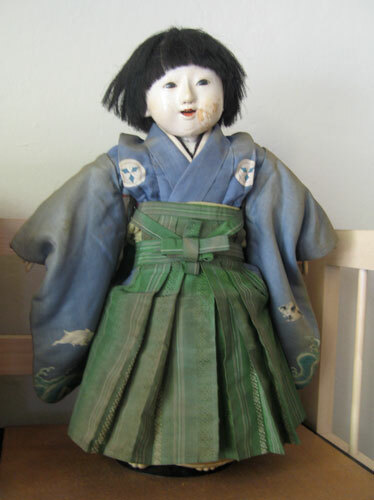 While this had made him look really strange and sloppy, having been dressed like that for so many years meant the back side of his hakama bore the brunt of the sun fading, leaving the front (which had been in back) in somewhat better shape and a brighter shade of green. Thanks to Alan Pate, I had been emailing back and forth with Anne Weaver, a restoration specialist, for several days, sorting out where and when we would meet. When I left home and headed to the airport Friday evening it was foggy and cold, which is typical for summer in the Bay Area. The little fellow was safely tucked away in my laptop bag, which I thought might give the TSA agents at the airport a bit of a surprise when they saw him go through the x-ray machine. If it did, I’ll never know, as I was herded through security too quickly to notice. Being short of stature, I am always grateful for the tall people in life who offer to reach up and put things in overhead compartments for me. Up went the little fellow, snug as a bug. 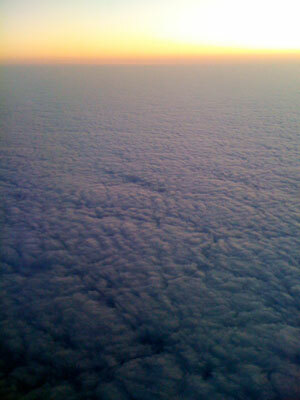 As we lifted off and headed south, I marveled at how fog smooths out all the hills and valleys below. I pressed my nose to the window and watched the sun set and stars come out while the fog thinned over the Central and South Valleys. Just as we came in to land in San Diego, fireworks started going off across town. It was quite an entrance. My friend John drove us through the endless palm trees and cool night air. First thing in the morning we were back on the road heading to see Anne Weaver. Confession: I am not a morning person. Fortunately, Anne Weaver is, and she greeted me at the door with a cup of coffee and bouyant enthusiasm. 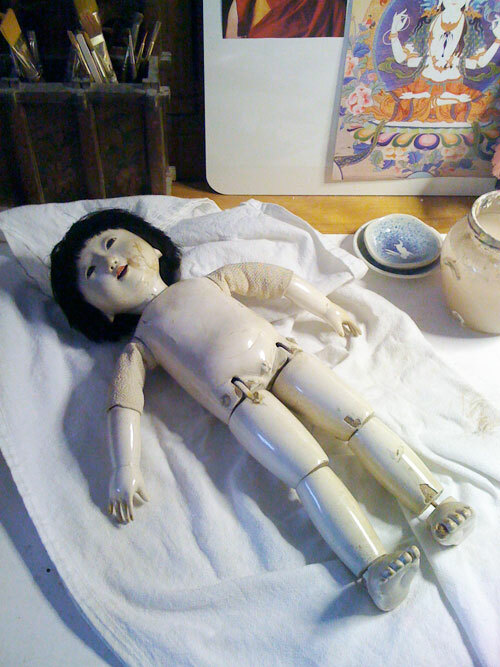 Two hours later, we’d chatted about doll restoration and mingei (folk crafts), two of Anne’s specialties. We enjoyed a delightful breakfast and went over the doll and his clothes inch by inch. Here he lays on Anne’s work table, ready for inspection. Anne and I discussed ideas and options for the restoration, along with a tentative schedule. It may be a few weeks before I see him again, but I’m sure he is in safe hands.